“Not everyone thinks it’s an honor to wear the hat, but they’re all good sports,” says Toni Cannon, the senior living community’s fitness coordinator. For the past 10 years, Toni has coordinated a Wii bowling tournament for residents. 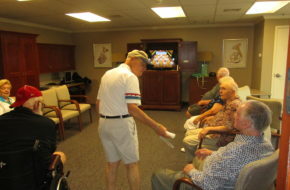 Two of Cumberland Crossings’ home video-game systems were donated and as residents experimented with various games, bowling became the favorite. “I’ve tried to do the golf, but no one wants to, not even the golfers. The baseball game is hard and tennis is difficult. I think they like the bowling because it is a simple game, easy to learn and everyone understands it,” Toni says.